To be kind to others, you need to start with yourself. People often find some difficulty in caring for themselves, in receiving love, in believing they deserve to be happy. Imagine for a moment the amount of energy you expend brooding over the future, ruminating about the past, comparing yourself to others, judging yourself, worrying about what might happen next. That is a huge amount of energy. Now imagine all of that energy gathered in and returned to you. Underlying our usual patterns of self-preoccupation, stinging self-judgment, and fear is the universal, innate potential for love and awareness. Loving kindness meditations point us back to a place within, where we can cultivate love and help it flourish. Developing care toward ourselves is the first objective, the foundation for later being able to include others in the sphere of kindness. This loving kindness practice involves silently repeating phrases that offer good qualities to oneself and to others. You can start by taking delight in your own goodness—calling to mind things you have done out of good-heartedness, and rejoicing in those memories to celebrate the potential for goodness we all share. • May I live in safety. • May I have mental happiness (peace, joy). • May I have physical happiness (health, freedom from pain). • May I live with ease. Repeat the phrases with enough space and silence between so they fall into a rhythm that is pleasing to you. Direct your attention to one phrase at a time. Each time you notice your attention has wandered, be kind to yourself and let go of the distraction. Come back to repeating the phrases without judging or disparaging yourself. After some time, visualize yourself in the center of a circle composed of those who have been kind to you, or have inspired you because of their love. Perhaps you’ve met them, or read about them; perhaps they live now, or have existed historically or even mythically. That is the circle. As you visualize yourself in the center of it, experience yourself as the recipient of their love and attention. Keep gently repeating the phrases of loving kindness for yourself. To close the session, let go of the visualization, and simply keep repeating the phrases for a few more minutes. Each time you do so, you are transforming your old, hurtful relationship to yourself, and are moving forward, sustained by the force of kindness. 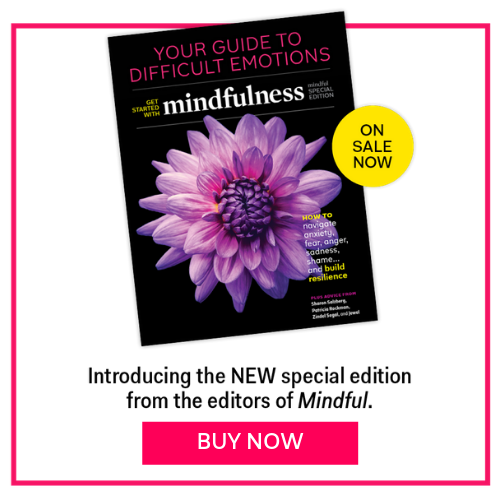 This article also appeared in the June 2015 issue of Mindful magazine.